Great location, Great staff and Very well designed apartment. Check In process was super easy and we enjoyed our stay if not for the sofa bed debacle. Staff is helpful, provide clear information about BCN. Comfortable place, our family all like here! Great location, steps away from Metro. Very clean and modern flat. The staff were very helpful and informative. The location was great. The metro is at both corners and their are plenty of restaurants and shops to buy groceries from that stay open all night. It was a family of five and we were able to walk to most of the major sites and the metro was easy to use. They even have a corner in the reception area where you can get tea, sugar, tabs for the washer as well as other little things which was very helpful. I would highly recommend, especially if you have a family because you can cook as well instead of eating out the whole time. The staff was very nice. I like their essential corner where they provide coffee, tea, oil, cookies, shampoo, shower gel, salt, pepper etc. The space was roomy and perfect for our family with two young children. apartment is very clean and smell fresh. Staff (Martina) very friendly and helpful. She booked our transfers from port and to the airport We will definitely booked this place again when we go back to Barcelona. The apt was amazing and also the location , nearby the metro station and bus station , easy by walk as well. Everything perfect . Reception really friendly and helpful . Plenty of restaurants and groceries nearby. Next to subway station and bus stops. Staff are excellent and very friendly. reception staff was very very helpfull.. decoration and furniture was new and modren .. comfort sofa bed.. kitchen and every thing more than good.. nearby supermarket and metro station (rocafort) just 1 min walk. i came from gulf area this is best apartment i visited in my euro trip. 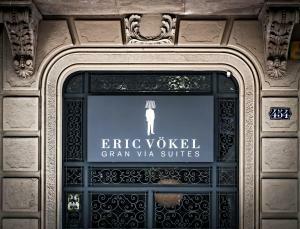 Lock in a great price for Eric Vökel Boutique Apartments - Gran Vía Suites – rated 9 by recent guests! 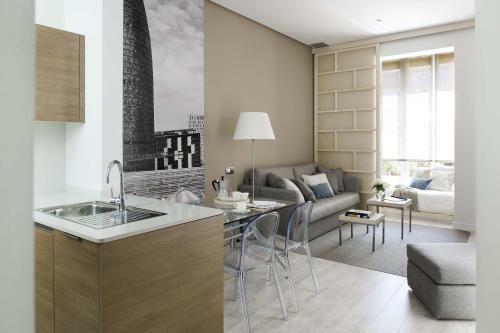 One of our top picks in Barcelona.Eric Vökel Gran Via Suites are boutique apartments set in central Barcelona, 10 minutes’ walk from Plaza de Espanya Square. 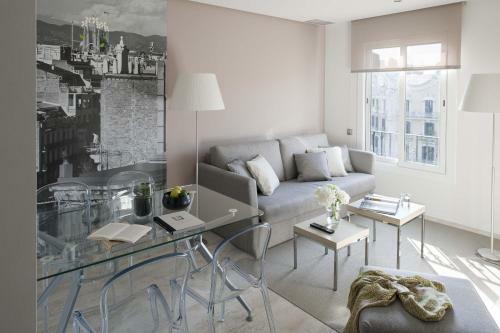 These chic apartments offer free WiFi access. Each air-conditioned apartment at Eric Vökel has attractive, contemporary décor. All accommodations has a well-equipped kitchenette and a spacious living area with a flat-screen TV. There are several bars and cafés within 350 feet of the Suites. Set on Gran Via Avenue, the apartments have easy access to a range of supermarkets and shops. The Vökel is just 20 minutes’ walk from Montjuïc Mountain and Catalunya’s National Art Museum. The famous Las Ramblas and the surrounding Gothic Quarter can be reached in 10 minutes, by Metro. 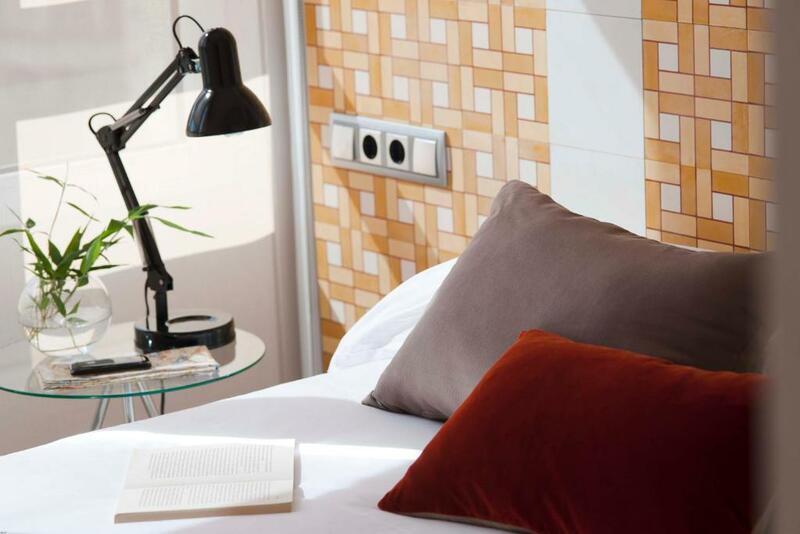 When would you like to stay at Eric Vökel Boutique Apartments - Gran Vía Suites? This bright, air-conditioned apartment has attractive contemporary décor. It offers one double bedroom, one twin bedroom and one single bedroom, as well as 2 modern bathrooms and a balcony. The spacious living-dining area features a well-equipped kitchenette, a flat-screen TV and double sofa bed. Free Wi-Fi access is included. This bright, air-conditioned apartment has attractive contemporary décor. It offers one double bedroom and a modern bathroom. The spacious living-dining area features a well-equipped kitchenette, a flat-screen TV and double sofa bed. Free Wi-Fi access is included. 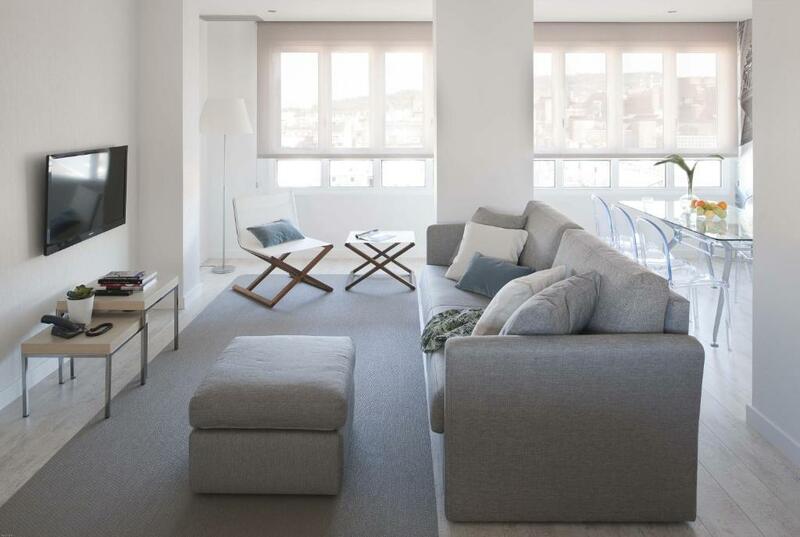 This bright, air-conditioned apartment has attractive contemporary décor by Eric Vökel. It offers 2 bedrooms, a modern bathroom and a balcony. The spacious living-dining area features a well-equipped kitchenette, a flat-screen TV and double sofa bed. Free Wi-Fi access is included. This bright, air-conditioned apartment has attractive contemporary décor. It offers 2 bedrooms, a modern bathroom. The spacious living-dining area features a well-equipped kitchenette, a flat-screen TV and double sofa bed. Free Wi-Fi access is included. 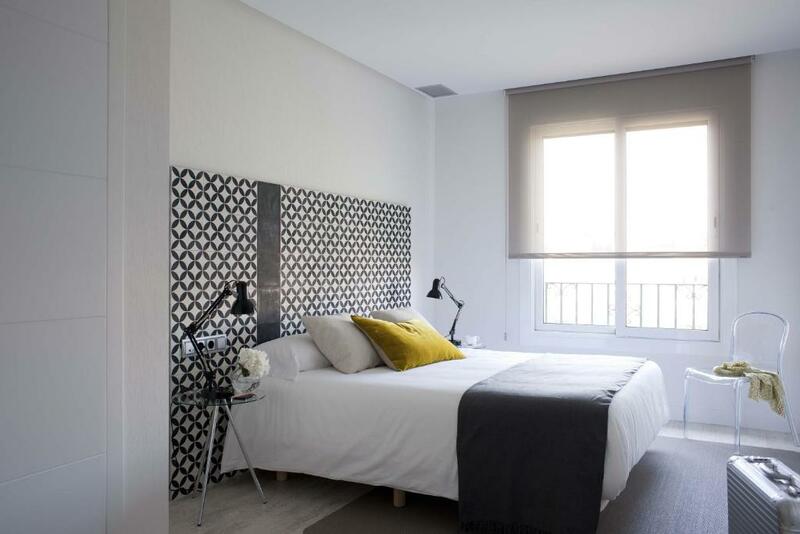 House Rules Eric Vökel Boutique Apartments - Gran Vía Suites takes special requests – add in the next step! Eric Vökel Boutique Apartments - Gran Vía Suites accepts these cards and reserves the right to temporarily hold an amount prior to arrival. If you arrive outside reception opening hours, you can use the check-in machine using the information on your booking confirmation. Please contact us if you believe you are going to arrive later than 18:00 and we will send you instructions on how to use our automatic check-in machine. 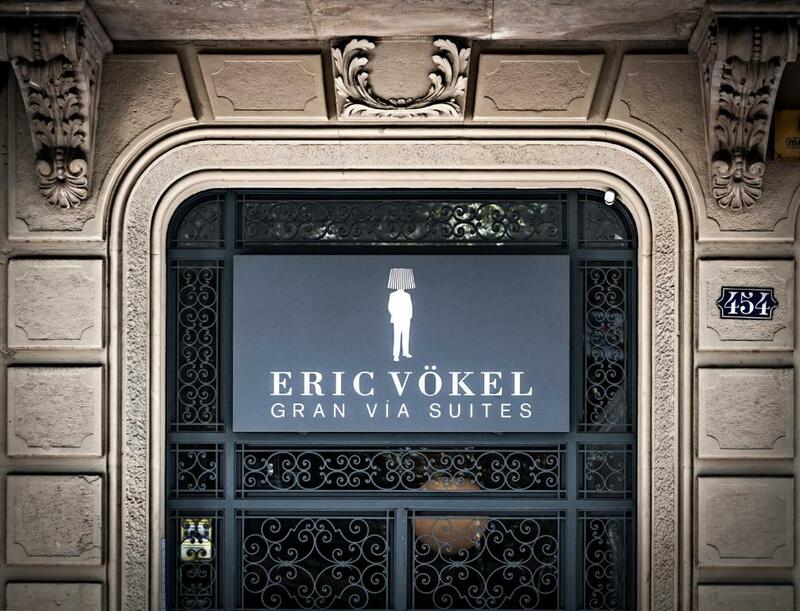 Please inform Eric Vökel Boutique Apartments - Gran Vía Suites of your expected arrival time in advance. You can use the Special Requests box when booking, or contact the property directly using the contact details in your confirmation. Bit dark in one bedroom (looked into internal courtyard), and couldn’t open window in front bedroom as noisy road. Staffs are nice and sweet. Location is convenient. Room is neat. Can’t ask more than that. Everything!Wonderful experiences.Deffenitly will come again! There was nothing not to like. It was better than our expectations. Andy the receptionist was so welcoming and made us feel at ease as soon as we arrived. We had the apartment on tbe ground floor with a garden. It far exceeded our expectations. Very clean. All utensils and white goods were spotless. The bedding and matress was as if new. The bathroom was so clean with warm white fluffy towels. Exceptional. Sometimes the wifi connection is weak. Lacks a big whole-body mirror. The location was a great access by metro to every city spots, only 1-2 min walk to Rocafort metro. Very comfy bed! Rooms were clean.The reception is friendly. A lot of things needed to be fixed - the hair dryer broke (replaced the next day), the couch cushion kept falling out, the bathroom towel rack didn't heat up half the time. The air conditioning was also weird - one controller for the whole apartment, it was super warm in the bedroom and cold in the living room / kitchen area. Good location next to the metro. Walking distance from Sants station, which was great for day trips. Sant Antoni is a nice neighborhood. Good soundproofing - could barely hear the cars on the street, which was great. The kitchen was well stocked with plates pots pans etc. Overall good value. 1920s elevator needs an upgrade. So small my stroller didn't fit.